Okay. So first off, it is not very often that I post pictures of myself (almost never) but here you have it. 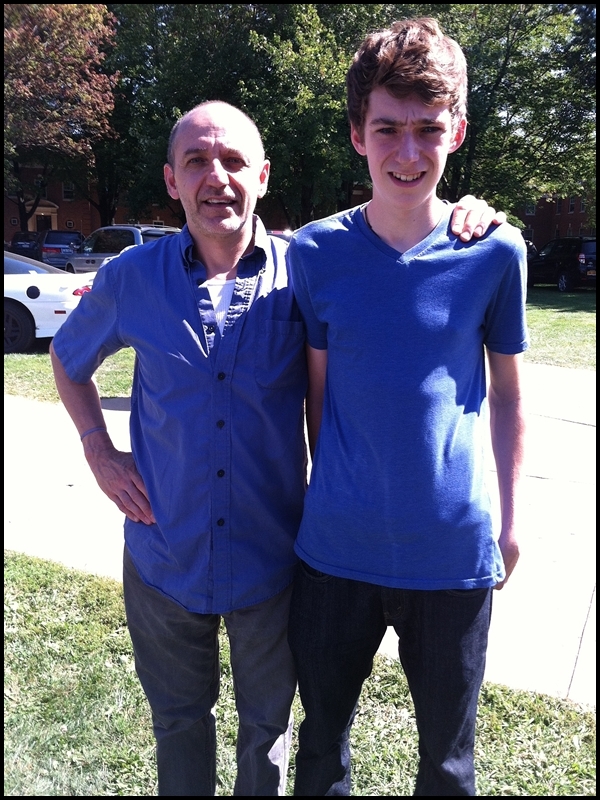 This is a photo of my son and I as we (his mom and I) were dropping him off at his first year of college (the color-coordinated shirts were purely coincidence). And as I look at this photo I ask myself a few things. One is, when did my son get so tall and I begin to shrink? And another is, how can this be possible? Wasn't it just yesterday I was sending him off to kindergarten? I have often thought/contemplated the passage of time but this is a milestone event. I have also often pondered what time is. Is it even real? 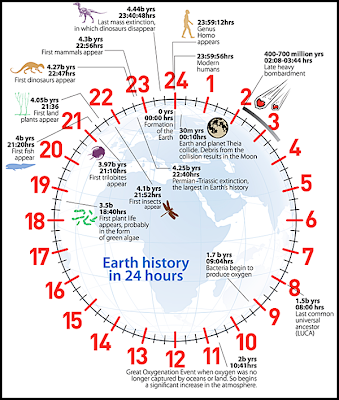 In the scheme of things, we as humans have been around for such a short period of time. 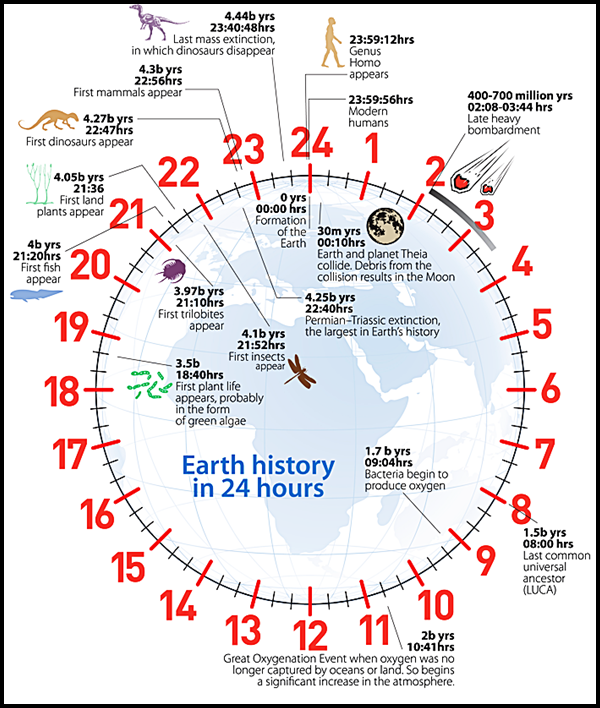 A good if not simplistic example of this is in the graphic below which illustrates the history of time on earth in a 24-hour capsule. Modern humans (us) don't appear until a few seconds (yes seconds!) before the 24-hour mark, meaning we have just gotten here. Then why all the stress and worry I also wonder. There have been so many before us with the same problems and worries and in the end they (the worries) don't matter at all. The key, I think, is to be aware...to be in the present moment; to be awake. Because all that there is, I also believe, is the present moment. The past is history and the future has not happened yet, and the present moment (no matter how difficult or boring it may seem) is really all there is. And when one lives in the present moment--being aware of all of its beauty and sometimes suffering--they are, in a way, fully alive...awake. There are plenty of versions of the following story floating around regarding when the Buddha was asked who or what he was. You may have heard this before; this version I found here). When the Buddha started to wander around India shortly after his enlightenment, he encountered several men who recognized him to be a very extraordinary being. They asked him: "Are you a god?" "No," he replied. "Are you a reincarnation of god?" "No," he replied. "Are you a wizard, then?" "No." "Well, are you a man?" "No." "So what are you?" They asked, being very perplexed. Buddha simply replied: "I am awake." For me personally it is very difficult to be present all of the time. I suspect this to be true for most. But when I am (with conscious effort) I find that things can be pretty incredible, no matter how mundane a task...such as being consciously aware of my fingers tapping a keyboard as I am doing now. Time can fall away and become, in a way, illusionary. Even if for a moment. And another thing that I find happens when being present is awe. And this brings me to my next quote. What I really believe is meant by this is that we as adults--while not shunning our adult responsibilities--need to lighten up and not worry so much...to be in awe of life in the same way a child is; to look at things anew and with interest. To remember what really matters. And when I am present this sometimes happen. I become aware of how incredible life is, even its worst parts. But still, this takes great effort (I am not enlightened yet...not even close). So now, as I look at the above photo, I am in awe of the fact that my son has grown into such a handsome, kind, and intelligent young man. And I am in awe of the fact that I have made it as far as I have in this life. Time marches on (illusionary or not) but so do the good things (here, now, and in the future). And that's what I'm looking at.